Sign up - for the latest news, products and discounts. ​All personal information given is treated with respect, and will not be shared. Contact us - Not happy or have a brilliant idea? ​Then we would love to hear from you! We will try our best to respond to all inquiries within 2 business days. Our office is based in British Columbia, Canada (PST time). In January 2016, my daughter died. After six months off work, I become anxious, about returning to work and to a 'normal' life. stone. I was immediately hooked! One stone, turned into 2, then 5, and I could not stop. I found the process of creating dots very meditative and calming to my turmoil emotions and liken it to adult colouring books, except there was a gorgeous stone in my garden. The one thing that held me back was my amateur brush skills. (Nobody has ever told me I was good at art!). I made it my quest to make the perfect round dot in different sizes every time so I created the Mandala Dotting Tools. These dotting tools, made me want to share this easy craft and experience with others and demonstrate that beginners and non artists like myself can create amazing stones, while finding solace in the creative. 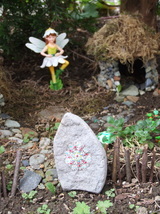 With each stone or picture I create, there is a sense of pride and wonderment - "Did I just create that?" I am still amazed to this day that I can design these amazing pictures, and produce different designs with just a simple dot. ​Please contact me, if you require any guided art sessions, speaking engagements or additional advice.